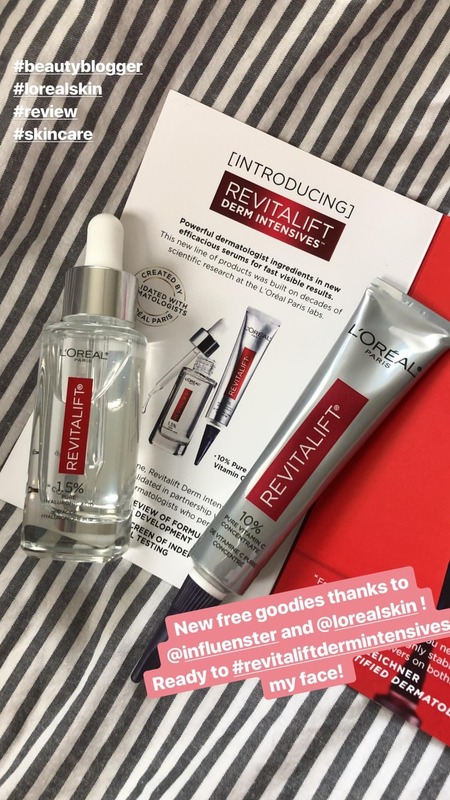 Recently I had the privilege to try out L'Oreal Revitalift Derm Intensives. I received the 1.5% Pure Hyaluronic Acid Serum, and 10% pure Vitamin C Concentrate. As you may know, the #1 concern I have when testing new products is if it will break me out. I am pretty acne prone to products and I am happy to report that these products were perfectly ok on my skin! The 1.5% Pure Hyaluronic Acid Serum feels like a little thicker than water, super smooth to my skin, and super easy to absorb into the skin. I apply the product about 2-3 drops around my face then spread to absorb with my fingers. What this serum does is enhancing the skin's own moisture retention for lasting hydration. I have combination oily skin, which often makes my T-Zone oily while my cheeks are so dry out, it often flakes in the winter time. Therefore hydration is super important for me to keep my skin balanced. Best news? It's only about $23? Amazing! For the 10% Pure Vitamin C Concentrate, it's a bit more of a thicker white substance, so I been applying it only to my cheek area, in case it might be too rich for my other areas of skin. I will update this review once I test this on other areas of my face. But so far both products seem to work great. After application on the skin, this product does make a slightly warm effect, and it's perfectly ok. Remember to apply sunscreen over it during the day! This baby is also only about $23, very good price for the product! I think the results are better than I expected, while I have been using these products, I have not seemed the flakiness around my cheeks. Better yet, within a week of using these products, my co-worker mentioned to me that my skin looks better than before! In the past 2 weeks, I been exhausted from traveling and gotten sick after, but I notice my skin is still bright and not dull looking. I also love these products as they are fragrance-free, no parabens, no mineral oil, and no synthetic dyes. Personally, I would purchase these for myself and recommend to my family and friends! I received these complimentary products from Influenster in return for 100% my honest review.